HEATHER EARNHARDT makes her galettes big — a foot and a half in diameter, maybe more. She makes pretty much everything big. At her tiny, adorable Seattle restaurant, The Wandering Goose, her gigantic layer cakes tower on the counter; a slice of one of them is at least as tall as it is wide. Her buttermilk biscuits are as big as a stretched-out hand. On Fried Chicken Fridays — The Wandering Goose stays open past lunch only on Fridays, because Earnhardt wants to be home other nights for dinner with her five kids — every plate’s loaded with three big pieces, three sides and a biscuit. 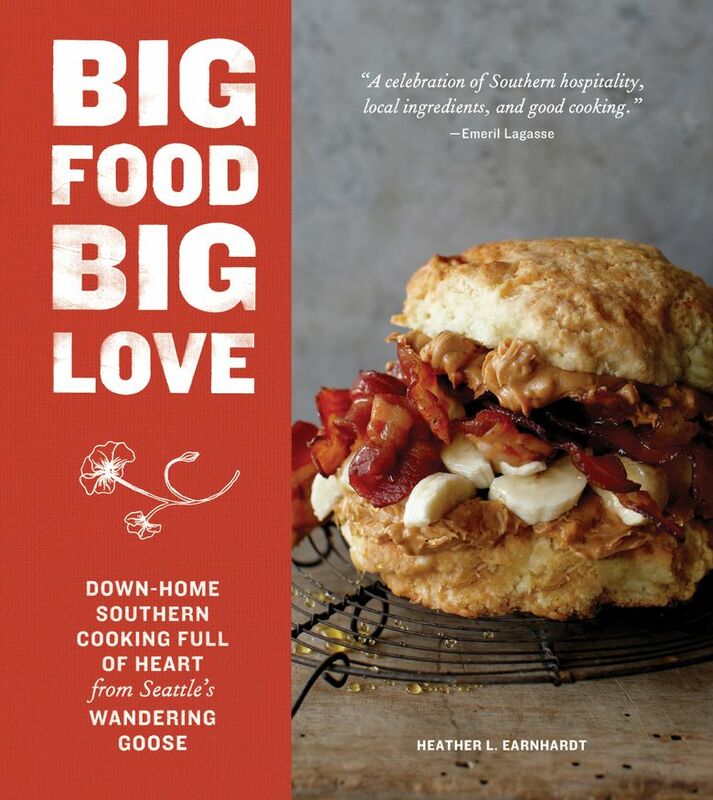 Earnhardt’s new cookbook, “Big Food Big Love,” is full of family photos and stories. Both sets of her grandparents lived in North Carolina, and their homes and kitchens were a source of consistency during her peripatetic childhood. She says she always wants cookbooks to be more autobiographical, more personal, “instead of just a straight-recipe kind of thing.” She wrote hers all herself, no co-author, and you can almost hear her slight Southern accent in her lovely, fluid style of writing. Reading it is like talking to a lifelong friend who happens to know all the stuff about cooking that your own grandmas might have told you. “Big Love Buttermilk Fried Chicken” expresses the hope that you’ll make enough to have a piece or two left over to eat as a midnight snack, standing in front of the fridge. It’s versatile, too; use thyme instead of rosemary, or a mix of apples and pears. For a savory version, try apple with an herb or chives, then add blue cheese or grate Gruyère over the top for the last few minutes of baking; or make one with butternut squash, chèvre and herbs. 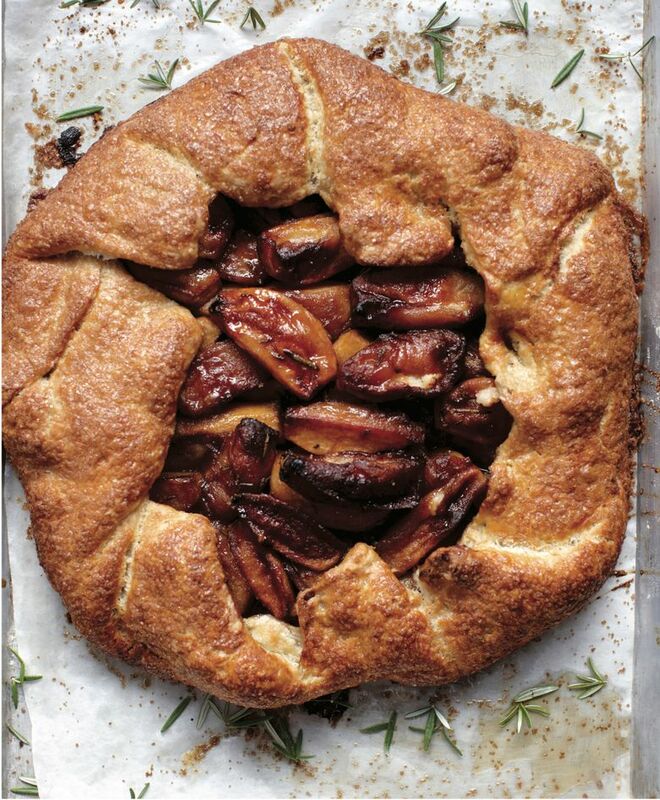 She serves it drizzled with caramel sauce and a scattering of extra rosemary. All you have to do is try, and if it turns out big and beautiful and imperfect, well, that sounds like love. 1. Refrigerate the dough for 1 hour. On a lightly floured surface, roll the chilled dough out into a 16-inch circle, ¼ inch thick. Place it on a parchment paper/lined baking sheet, and chill it in the refrigerator while you make the filling. 2. In a large skillet over medium-high heat, melt the butter. Add the apples and salt. Increase the heat to high, and sauté the apples until they start to brown, 5 to 6 minutes. Add the brown sugar, cinnamon and rosemary, and sauté for another 2 to 3 minutes. Spread the filling out on a baking sheet to cool. 4. After the filling has cooled, remove the dough from the refrigerator. Spread the filling evenly over the round, leaving a 2-inch border around the edge. Starting at one side, fold the 2-inch border of dough over the filling all the way around, leaving a gap in the middle where the filling shows. Brush the dough with egg wash, and sprinkle it with turbinado sugar. Bake until the crust is dark golden brown, 35 to 45 minutes. In a food processor, pulse the flour, sugar and salt five times. Add in the butter pieces, and pulse until the butter is the size of small peas. (If using a stand mixer, mix everything on low speed until the butter is the size of small peas.) Turn the dough out into a large bowl. Add the vodka slowly, using a rubber spatula to gently mix it in. Keep adding vodka until the dough is cohesive and can be patted together easily. Form the dough into a 1-inch-thick disc, and wrap it in plastic wrap. Chill it in the refrigerator for at least 1 hour before using. In a small bowl, using a fork, beat the egg and cream together until combined. Leftover egg wash will keep for 1 week in the refrigerator.